Eight days left, and Iran is still reeling from the debate between Mousavi and Ahmadinejad. The Mousavi - Rezaei debate also took place a few hours ago, and turned out (as expected) to be a much more subdued affair; you can see a detailed writeup on that debate here, and if you know Persian you can start watching it here. Just for an example of how much tamer this debate was than the last one, in yesterday's debate Ahmadinejad claimed that he was not running against one person but rather three (i.e. 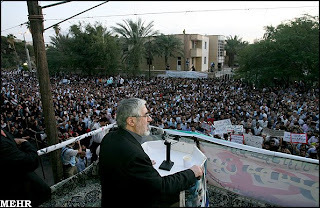 that he was the only pure candidate running against a corrupt establishment) and even went so far as to question Mousavi's wife's academic credentials...whereas in this debate Rezaei pressed Mousavi on his position on Article 44, which is part of the constitution about state ownership of industry; thus his position on privatization. So in terms of atmosphere, yesterday's debate is kind of like this one on the Simpsons whereas today's debate between Mousavi and Rezaei was more along the lines of Klassic Krusty with the heated discussion on collective bargaining agreements. Are Ahmadinejad's attacks backfiring? Apparently Rafsanjani is looking to have state television allocated for a live debate with Ahmadinejad on his accusations. Obama's speech a boost to moderates in the election - this has been my position as well, that the Obama administration is looking at ways to subtly affect the election in order to give Ahmadinejad as little to run on as possible without actually looking like they are attempting to influence the election. The debate between Mousavi and Ahmadinejad seems to have overshadowed his speech, but it should help nonetheless. Today is a day off from the debates, and then the remaining three will happen starting the next day. The next debate on the 6th will be Ahmadinejad and Karroubi, then Karroubi and Mousavi the next day, and finally Ahmadinejad and Rezaei.